FORT MYERS, Fla. — Tijuana Flats General Manager Miranda La Lone and Jim Farwell, a loyal Tijuana Flats customer, teamed up for a second year to provide the Fort Myers Police Department with 180 restaurant gift cards on Thursday. The pair did this as a gesture of appreciation for the officers’ commitment to providing excellent services to our community. “Now more than ever, our police officers need reassurance from the community that we support them and value the sacrifices they make every day for the safety of our community,” Farwell said. Just as he did last year, Farwell purchased 100 five-dollar gift cards from the restaurant for the FMPD officers. La Lone stepped in and covered the remaining 80 gift cards on behalf of Tijuana Flats. But within the last year, FMPD has added 15 sworn officers to the force for a total of 180. However, the increase did not stop La Lone from showing her support. “Tijuana Flats is part of this great community and is proud to support our police department,” she said. 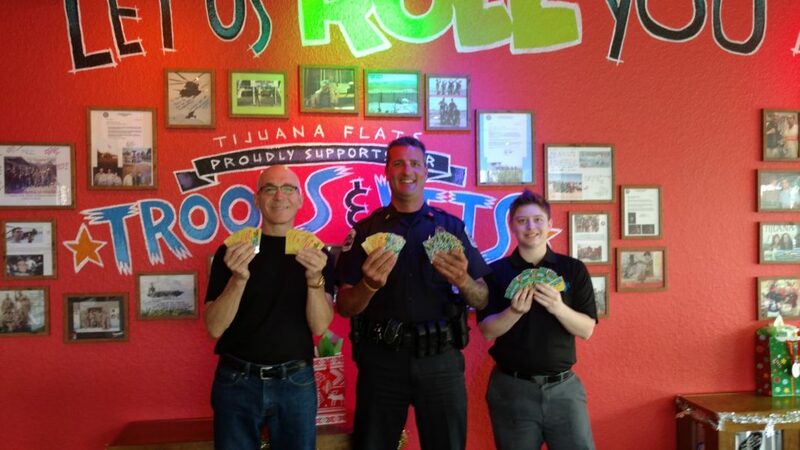 FMPD officials met with Farwell and La Lone at the Tijuana Flats at 8001 Dani Drive to receive the cards. FMPD will disperse the gift cards to officers in the next week.